Our friend Matt Boyle of Breitbart reports that researchers for conservative Chris McDaniel’s campaign have now found over 3,300 apparently illegal votes that were cast in the June 24 Mississippi Republican Senate Primary Runoff – and the counties where the most compelling stories of illegal voting have been reported have yet to be reviewed. 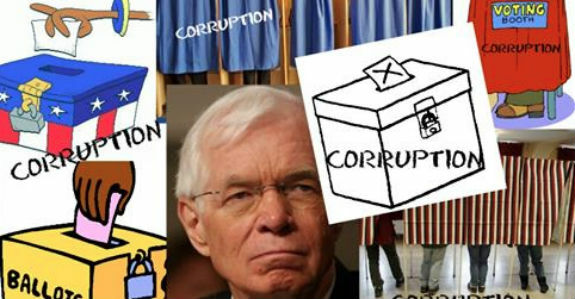 “Our volunteers on the ground have found over 3,300 irregular votes after examining fewer than half of Mississippi's counties, and that total does not include the Delta counties or even the more than 18,000 absentee ballots, which are sure to include many more irregularities, since that was the prime focus of Cochran's Get Out the Democrat Vote strategy,” McDaniel spokesman Noel Fritsch told Breitbart News. Boyle notes that with more than half of the state’s counties—and many of the state’s African American-majority counties, where many of the ineligible crossover votes are suspected to have occurred—still uncounted, that 3,300 vote tally is, according to the McDaniel campaign, just from looking at voters who voted in the June 3 Democratic primary, then crossed over—allegedly illegally—to vote in the June 24 GOP primary runoff. That’s about half the number needed to overturn the Mississippi Republican Senate Primary, and it doesn’t include any investigation into the allegation of vote buying, “walking around money” or any other of the allegations of illegal activity lodged against incumbent establishment Republican Senator Thad Cochran’s campaign and its allies. True the Vote and Tea Party Patriots volunteers are assisting the McDaniel campaign to determine if there were Democratic voters who illegally voted in the Republican primary runoff. This labor intensive effort has produced great results so far, and volunteers are still needed, including lawyers with election law experience, as the investigation turns toward the majority African-American counties where the most compelling allegations of illegal voting have surfaced. Conservative organizations, such as True the Vote, the nation's leading voters’ rights and election integrity organization, and its founder and President Catherine Engelbrecht and Jenny Beth Martin and Tea Party Patriots are assisting the Chris McDaniel campaign’s investigation into allegations of vote fraud – the Republican National Committee is MIA. We think it is time for Republican National Committee Chairman Reince Priebus to take a stand against what happened in Mississippi. With many conservatives once again talking about bolting the Republican Party you would think it would be in his interest to keep the grassroots conservative base of the Party unified by ensuring fair, corruption-free Republican primary elections. But so far Priebus has been silent about what happened in Mississippi. Conservatives must demand that RNC Chairman Reince Priebus and the leaders of the Republican Party stand with the grassroots of the Party to investigate allegations of vote fraud in the Mississippi Republican Senate Primary Runoff. Former Governor and Republican National Committee Chairman Haley Barbour, Mississippi Republican National Committeeman Henry Barbour, former Mississippi Senator Trent Lott, Senator John McCain, Senate Republican Leader Mitch McConnell and NRSC Chairman Senator Jerry Moran of Kansas must be held personally and politically responsible for the scorched earth tactics used against conservatives in Mississippi. One way to get the attention of Republican National Committee Chairman Reince Priebus and the RNC is to sign our letter to Priebus to let him know in no uncertain terms that conservatives are outraged by what happened in Mississippi, and that we demand fair, corruption-free Republican primary elections. And that until the RNC stands with the grassroots conservative base of the Party against the kind of tactics used in Mississippi, we conservatives will withhold contributions to the RNC and especially the National Republican Senatorial Committee that was the epicenter of the vile attacks on Chris McDaniel. Click here to sign our petition to Republican National Committee Chairman Reince Priebus to let him know in no uncertain terms that conservatives are outraged by what happened in Mississippi, and that we demand fair, corruption-free Republican primary elections. Submitted by whittakerrobertj on Wed, 07/02/2014 - 18:20. Don't blame Reince Priebus for not taking action. As I recall I advised you nothing would happen concerning voter fraud because of that 1982 Federal Court Decree. Remember my citing: US District Court for the District of New Jersey, Civil Action No. 81-3876 filed 11-1-1982 by the DNC against the RNC ? By agreement the RNC agreed not to challenge voter fraud due to their admitting that they engaged in suppressing black voters from exercising their right to vote. That Court Decree became national in its effectiveness and the latest review by that court has extended its limitations over the RNC until 2017..Coincidence that the Obama appointed judge should extend it past the next Presidential election eh? I missed out out on getting your $10,000 reward for noting the who, what, where and when on how to fix the RNC so that it could win elections. It seems to me that you ignored the most effective reason why the RNC cannot win as they engaged in devious political activity back in New Jersey in 1981-1982 and will suffer for it as long as the New Jersey Federal District Court keeps finding reasons to extend its decision.